Kevin Todd – CHI Centers, Inc. 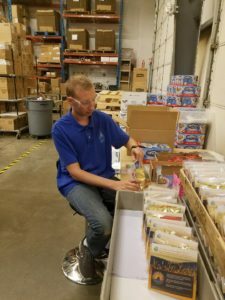 When Kevin Todd came to CHI Inc. in July 2014, he started in the Day program working on various contract jobs within CHI’s facility and was paid a few cents an item for his work. Kevin later enrolled in CHI’s food service training program, where he was still paid an hourly rate less than the minimum wage working in the cafeteria. After CHI informed the Chesapeake Bay Roasting Company the agency was no longer going to operate subminimum wage contract work, the company agreed to consider hiring a person supported by CHI to work at their warehouse in Crofton. Kevin, who lives in Bowie, was hired by Chesapeake in September, and CHI provided on-site job coaching supports. In a short time, Kevin’s productivity and accuracy were the same as other company employees. At this job, Kevin earns $10 an hour, which is 75 cents more than the minimum wage in Anne Arundel County. We’re looking forward to celebrating with Kevin when he reaches his 90-day benchmark at the end of this month!